This card shows that you have already completed the circle of struggle. After spending too many resources and lots of energy looking for success, you have finally overcome the obstacles. The sweat off your brow was worth it - your efforts have finally been rewarded. You may find yourself living in a world of abundance where poverty and suffering have no chance to intervene. Although it sounds marvelous and satisfying, the card depicts a lot of responsibilities on your side. You are now the sole problem solver in your circle of family and friends which could even propel you into another world of challenges. At this point, you are also flooded with responsibilities to maintain your success. The businesses that you have started are flourishing and keeping you on your toes. The main problem is that these issues could overwhelm you if you lose control, which requires you to make sure that you know how to prioritize and solve the relevant ones. Although it sounds marvelous and satisfying, the card depicts a lot of responsibilities on your side. In the real world, this card expresses how people try to burden themselves with responsibilities after they attain initial success. It is like graduating from college, getting a job and then starting to make it in the real world. More challenges keep coming, you may find yourself looking after you parents, starting a family and at the same time look to others, which may make you feel as though you not yet successful. It becomes a burden because at some point you find out nothing is enough to accomplish all these duties. The general lesson of the card is that people should be moderate, prioritize and understand that they cannot solve everything, some things must be let go, given to others, the burden shared. 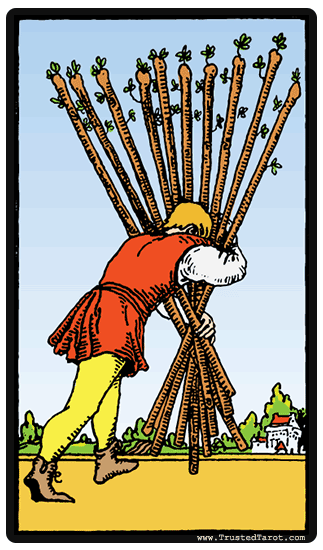 When the Ten of Wands card is reversed, it indicates that you are truly burdened by circumstances which are not necessary in your life. Look around and see what is bothering you that will not positively impact yourself even if you rectify it. Drop them all and be a free being that can think soberly and do things accurately. Anything that does not add value in your life is not worth your time, so let it go.